Is Cisco One of the Best Dow Stocks for New Investors? Cisco is reporting earnings in a shaky networking market -- but maybe it's only shaky because the sector giant is stealing back some lost market share. Cisco Systems (NASDAQ:CSCO) is set to report third-quarter earnings after tonight's closing bell. Shares have gained 28% over the last year, though without much movement in the last three months. Has Cisco lost all momentum, or is the stock spring-loaded for an earnings-powered jump? The answer to that question could make Cisco one of the best stocks to buy on today's Dow Jones Industrial Average (DJINDICES:^DJI) -- or one of the worst. Analysts expect Cisco to report adjusted earnings of $0.49 per share on sales of $12.2 billion. Both results would show year-over-year percentage growth in the low single digits. That would be right in line with last quarter's modest 5% revenue growth but far below the 47% earnings jump that Cisco reported three months ago. For what it's worth, management's earnings and revenue guidance straddles the Wall Street estimate, with one foot firmly planted on each side of the average estimates. Mind you, Cisco tends to lowball guidance figures and has beaten earnings estimates in each of the last 18 quarters. So you should expect another positive surprise tonight, to use an oxymoron. The networking industry is going through a rough patch right now. Alcatel-Lucent (UNKNOWN:ALU.DL) has seen so many tough quarters that the company is fighting for its very survival despite a strong technology portfolio. Juniper Networks (NYSE:JNPR) crushes analyst targets left and right, but the stock never soars on these results. In fact, Juniper shares traded sideways over the last 12 months and missed the 2013 market rally entirely. Investors in this sector are keeping their distance, expecting another big plunge any minute. And why not? 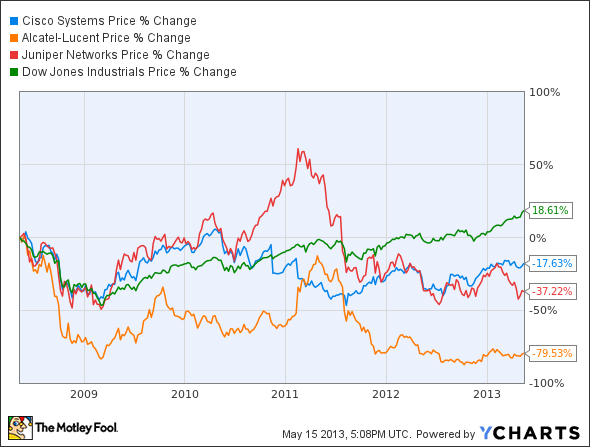 All three of these stocks have underperformed the Dow in the last five years, trading down while the Dow trended up. So what does this boil down to for Cisco tonight? For one, Cisco shares took some corrective medicine after the second-quarter report, which only edged out analyst estimates and didn't jack up next-quarter expectations sky-high. They've been treading water ever since, but I don't think Cisco's business has done the same. The company has restructured its entire business model in recent years, and some of the craziest moves are starting to pay off. Keep an eye on growth in the unified computing server line, which jumped 87% year over year last quarter. And these server systems are often sold as a package deal with high-end network routers. That's exactly the high-margin division that Cisco would love to see improving. Juniper said a couple of weeks ago that enterprise sales was a challenging market. I think Cisco is grabbing market share in that high-end segment. If so, this report should be a turning point for Cisco investors as margin-boosting wins unlock a catalyst for share prices. And that's why I think Cisco is one of the best Dow stocks you can buy today. This stock is about to enter another growth phase.